The National Model Railroad Association, NMRA, is the largest organization devoted to the development, promotion, and enjoyment of the hobby of model railroading. The NMRA was founded in 1935 in Milwaukee, Wisconsin, making this our 73rd year in service to the hobby of model railroading! The Southeast Region, SER, covers the States of Mississippi, Alabama, Georgia, Tennessee, South Carolina, and a portion of the panhandle of Florida and the Asheville area of North Carolina. 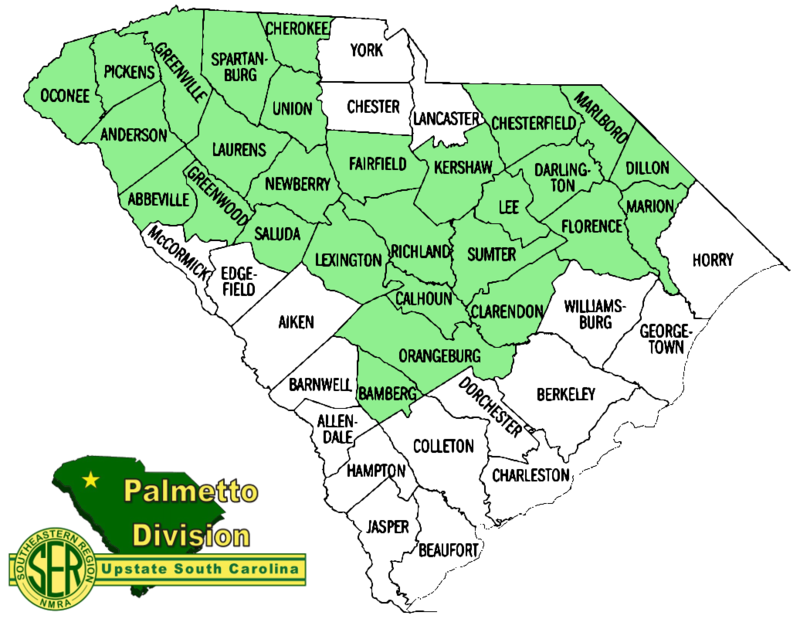 Abbeville, Anderson, Bamberg, Calhoun, Cherokee, Chester, Chesterfield, Clarendon, Darlington, Dillon, Fairfield, Florence, Greenville, Greenwood, Kershaw, Lancaster, Laurens, Lee, Lexington, Marion, Marlboro, Newberry, Oconee, Orangeburg, Pickens, Richland, Saluda, Spartanburg, Sumter, Union and York. Anyone living in this area who is an NMRA member is automatically a member of the Palmetto Division. There are no additional fees for the local benefits. You can sign up for NMRA membership (including the Palmetto Division) at the NMRA web site. Our Columbia 2019 Division Meet was held April 13 at Arsenal Hill Park in Columbia, SC. This historic building is home to the AMROC (Associated Model Railroads of Columbia) club. This is the first time we've met in Columbia in a LONG time, so we adjusted the format a bit to provide more of an informational "show and tell". We had 22 in attendance, and shared a great deal of info. Steve Todd gave his "High Tech, Low Cost DCC" presentation and demo'ed some of his gadgetry. Rich Lehman and Clark Gregory shared the history and vision of AMROC, then we adjourned downstairs to check out this intriguing set of layouts in various scales. After lunch, we toured Rich Lehman's excellent basement layout. Everyone indicated the meeting was time well spent. Our Spring 2019 Division Meet was held March 30 at SWU (Southern Wesleyan University) in Central, SC. We had a great meet at this nice facility, with great entries in the Tips & Techniques contest. Sandy Eustis had a great clinic on "Consider the Wye". We missed out on Howard Garner's "Awesome Awnings" clinic as he had an injury. Attendance was down, but it seemed that all had a great time. After lunch, we were able to visit three excellent layouts: Bob Folsom's Norfolk & Western Pocahontas Division, Howard Garner's Cascade Western, and the Central Railroad Museum. The Central Museum also hosted an excellent scenario-based operations session for us. Our Fall 2018 Division Meet was held on November 10, 2018 at the Berea Library. A big thanks to everyone who helped get the show started quickly. Attendance was not quite up to recent meetings, but those who attended reported a great time. We had quite a few "Favorite Models" this time, with some very close voting. We held our Spring NMRA Palmetto Division Meeting on Saturday March 10th, at the Woodmen of the World (WOW) Lodge in Greer. Steve Todd -- Need More Signs! After lunch, we toured the interesting home layout of Chuck Heynen in Clinton, SC.